I can’t believe it’s almost September! Yikes! Not just because the clock is continually ticking down to when I absolutely have to, have to, HAVE TO have my thesis done (December 15th, no exceptions) but because the end of my favorite produce season is almost near. Oh summer and your juicy peaches, sweet corn reminiscent of candy, fantastic watermelon, sweet tomatoes, crunchy peppers, how I love thee! Not that I don’t like the apples and pumpkins of fall [I mean, hello, I’m a pumpkin-obsessed girl here] or anything like that… but summer means relaxing strolls through the farmer’s market while dripping in sweat because we went running beforehand getting the absolute best fruits and veggies imaginable. And I’ll be sad to see that end. However, there’s still plenty of time to gather yummy summer foods so I’m going to do my best to share all my new favorite summer dishes now, before it’s too late. 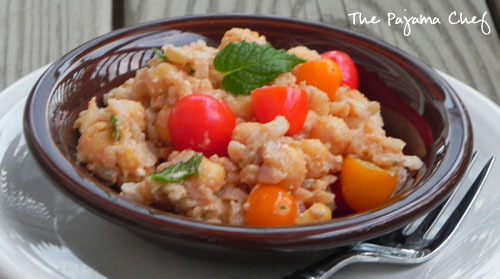 This simple rice salad is one of those fabulous summer dishes that I wanted to be sure to share. 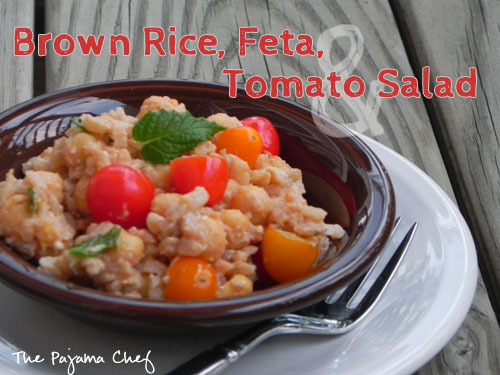 Brown Rice, Feta, and Tomato Salad is filled with pantry staples like brown rice and chickpeas, but is spiced up with three of my favorite things on the planet: cherry tomatoes, feta, and mint. Oh goodness, that combination gets me every time! It is so so so good. You should have seen me trying to maneuver my bites as I ate this salad for lunch on campus last week. I was sitting in the shade of a huge maple tree, balancing my Kindle on my lap while trying to carefully construct each bite to contain a piece of tomato, a chickpea, some feta, and some mint, all while avoiding the rice clusters that I ate last because they weren’t as exciting. I’m sure I looked perfectly ridiculous… and for the record, this is all 100% true, even if that might sound a bit fabricated for the sake of a blog post. Eating outside while reading is pretty much what I do everyday it’s nice outside. I’m trying to break myself of the habit of eating at the computer/while I’m working, to give myself a break in the day. So far, it’s working pretty well. I’ll be terribly sad when late fall comes and it’s too cold to do that… but maybe soon after that I’ll land a great job in a warm climate and I can eat outside year round! That would be nice! But until then… there’s this fabulous salad, with a wonderful mix of sweet and fresh flavors, paired with hearty grains and legumes [I just looked it up, chickepeas are legumes, fyi] and a little feta for some salty flavor. I think it’s best that I make it it again before tomatoes return to their dreary out-of-seasonness… and it would be remiss of me to not encourage you to do the same! Prepare brown rice according to package directions. After brown rice is ready, set aside to cool. Meanwhile, combine chickpeas, feta, tomatoes, and mint in a large bowl. In a small bowl, whisk together olive oil, balsamic vinegar, and brown sugar. Add about 2/3-3/4 of prepared rice to chickpea mixture and stir to combine. Don’t worry about being precise, just eyeball the amount. I was probably closer to the 2/3 mark. Pour dressing over and toss to coat. Add freshly ground black pepper to taste. Serve warm or refrigerate for a cold lunch or side salad. Even though I ADORE pumpkin I am definitely mourning the imminent loss of tomatoes! I need to try this before the season is over! I love pumpkin + fall flavors, too, but i am sad to leave my beloved summer produce behind. this is a great use for the tomatoes that are slowly tapering off in our garden. YUM! Where did the summer go????? May be we will have an extended summer and with it an extended tomato harvest. that would be so nice 🙂 but i am ready for fall weather. Yay! I’m excited for the produce of fall, too; but am definitely taking full advantage of the rest of summer. Especially in terms of tomatoes! This rice looks perfect! I’m all ready for fall but I will certainly miss all the fresh produce. This looks super delish! Yeah, I’m in disbelief about September’s arrival too–craziness. Looks delicious! This would be perfect to help use up the abundance of tomatoes and mint I have growing in the backyard!